Really easy to use, come with a breast pump adapter so can alternate between bottle and storage cups with a single adapter, easy to clean and use, and store can be stored on top of each other, have bought two packs when we move onto food can reuse them for storing baby food! These pots are great if you are pumping with the Avent hand or electric pump. They are sturdy, stackable, can be used in the microwave and dishwasher. I also use them as storage pots for weaning. Only downside is that if you want to use them directly as bottles you need the adapter to attach the bottle tops and you only get one with pump systems. Bought these as a reusable alternative to milk storage bags. Have used mine over and over again with no real issues. They stack together easily when putting in fridge or freezer and wash well. The lid has an area that you can write down dates etc with pencil. My only major quibble with the ones I have is that the kids don’t always screw on straight without a bit of force so have leaked on occasion if tipped over. Otherwise a great pot for milk or other food storage. I love this product! The pots fit onto my breast pump, so I can express directly into it, seal it with the lid and either freeze it, or put the teat lid on and feed it straight to baby! Saves so much washing up and sterilising! Fantastic product, I'd highly recommend for anyone wanting to save time. These are great. They attach to my Avent pump which means I don’t have transfer milk across. They sterilise well both in the microwave and cold water. You can stack them too which is so much better when storing in the freezer as I found bags fell over. They do pick up that orangey colour from the dishwasher but does not affect use at all. I’ve now finished pumping but these have been great to store purée due to the measurements. 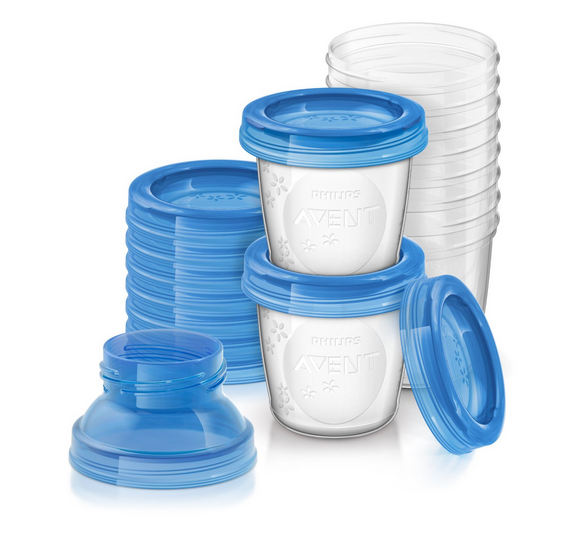 I was using the Avent electric steriliser and these attached to the pump very easily, they have a screw top lid and it is perfect to store in the fridge if using within the time period for refigerated milk. I used wipe clean markers to put the date on and washes off easy. Perfect for what I needed. 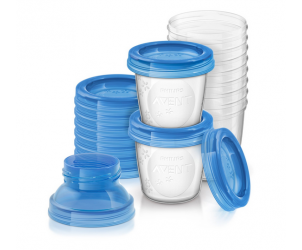 Philips Avent Food Storage Cups for Mothers' Milk Reusable 180ml 0 Months is designed to store maternal milk safely. These cups can be hermetically sealed in order to keep perfectly airtight during transport and provide optimum storage of maternal milk. The food storage cups are developed to be stored in the fridge or in the freezer. It is possible to sterilise the cups, or to use it with a bottle warmer. Practical, the cups and the lids are stackable for space saving. The contents and the date can be written directly on them.